Huawei Honor Note 8 With 6.6 Inch QHD Screen To Launch In China This August 1, 2016! 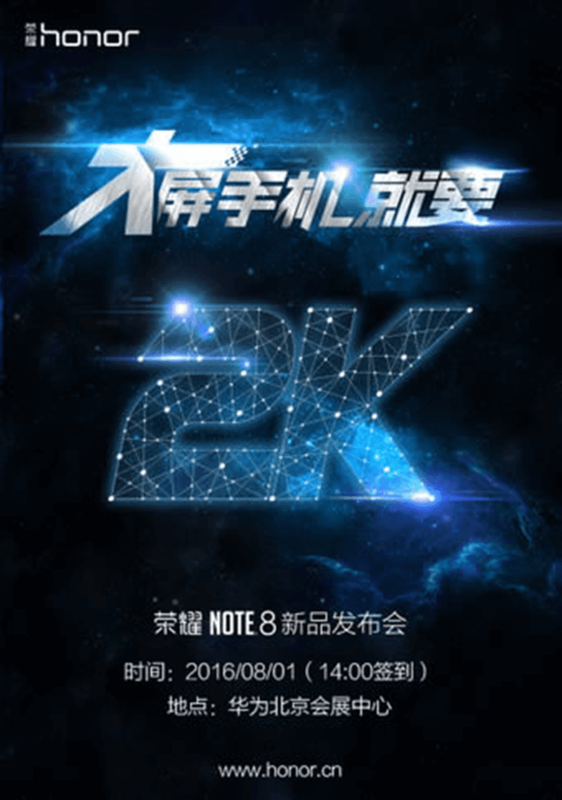 Home / huawei / mobile / news / Huawei Honor Note 8 With 6.6 Inch QHD Screen To Launch In China This August 1, 2016! In China, Huawei is set to launch their latest handset, a phablet in particular. Dubbed as the Honor Note 8, it is the first Huawei handset to rock a HUGE 6.6 inch 2K QHD screen with 2560 x 1440 resolution. Related: Huawei Note 8 Launched, Boast a 6 Inch AMOLED 2K Screen And Kirin 955 Chip! Under the hood, everything else ins't confirmed yet, but TENAA listings suggest that there will be two versions of the Honor Note 8. The first one will carry Huawei's home-brewed 2.5 GHz 64 Bit Kirin 955 octa core chip, 4 GB RAM, 64 GB ROM, 4,400 mAh battery w/ fast charging using USB Type C, 13 MP main camera and 8 MP selfie camera. The other variant will be powered by a lower-clocked Kirin 950 chip, 3 GB RAM, and 32 GB ROM. Both devices with load with a fingerprint scanner at the back, LTE connectivity, Android 6.0 Marshmallow OS w/ EMUI 4.1. Given those teased specs, this upcoming device by Huawei is expected to be the more powerful competitor of the popular Xiaomi Mi Max. There are reports that the price will start at CNY 1,999 for the lower-end variant and CNY 2,299 for the higher-end model.